A recent GOBankingRates survey found that 55 percent of Americans are spending most of their money on guilty pleasures that could kill them: alcohol (14 percent), tobacco (7 percent), gambling (4 percent) and fast food (30 percent). The survey results show that Americans are wasting a lot of money on guilty pleasures that can hurt their wallet — and their health. Read on for the full findings. When asked what they spend the most money on, clothing is the top choice among respondents — with 34 percent selecting this option. However, the top guilty "deadly" pleasure is fast food, with about 30 percent of respondents saying they spend the most money on this option. You might think of fast food as more of a convenience than a guilty pleasure. But if most of your money is going toward fries, burgers and chicken nuggets, you might be committing the sin of gluttony. And, you could be hurting your health. Of course, not all fast food is bad for you. But if you're choosing foods high in saturated fat, you could see a rise in your blood cholesterol — which is a risk factor for heart disease and stroke, according to the American Heart Association. High-fat foods also can lead to obesity, and foods high in salt can raise your blood pressure. You're not doing your wallet any favors, either, by indulging in fast food. Iowa State University Extension and Outreach compared the cost of buying a take-out burrito versus making one at home and found that the fast-food version cost about $5 more. Based on that figure, if you eliminated one fast food run per week, you could save at least $260 per year. About 20% of men said they spend the most money on alcohol versus about 9% of women. Women are as likely to spend the most money on makeup as on alcohol, with 9% saying they spend the most on this option. Women are much more likely to spend the most on clothes — 42% versus 26% of men. On average, Americans spent $463 on alcoholic beverages in 2014, according to the Bureau of Labor Statistics. If it's your top spending category, you're likely shelling out even more. Drinking isn't necessarily bad. In fact, moderate alcohol consumption might provide some health benefits, according to the Mayo Clinic. But moderate means "one drink a day for women of all ages and men over 65, and up to two drinks per day for men 65 and younger." Older millennials (ages 25 to 34) are more likely than other age groups to spend the most on alcohol, with 20% choosing this option, followed by about 17% of young millennials (ages 18 to 24). 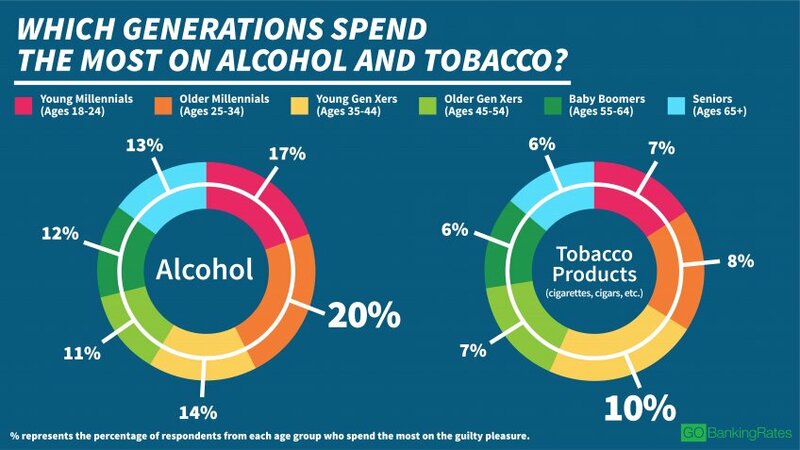 Young Gen Xers (ages 35 to 44) are the most likely of all age groups to spend the most on tobacco, with 10% choosing this option followed by nearly 8% of 25 to 34-year-olds. 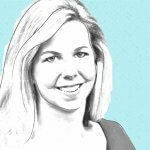 Another deadline — and costly — habit is smoking. The average price of a pack of cigarettes is $6.16, according to the Campaign for Tobacco-Free Kids. Someone with a pack-a-day habit would spend $2,248.40 in a year. This doesn't even include the other associated costs you don't think about. Furthermore, smokers are more likely to develop heart disease, stroke and lung cancer, according to the Centers for Disease Control. More than 480,000 people die each year from cigarette smoking. And, smoking causes more deaths than alcohol, illegal drug use, HIV, car accidents and firearm injuries combined, according to the CDC. Baby boomers ages 55 to 64 are more likely than other age groups to spend money on gambling. 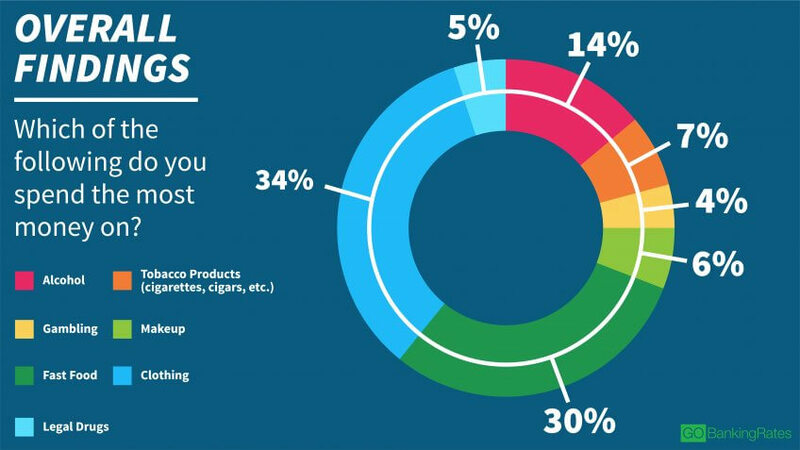 About 6 percent said this is what they spend the most money on. And 5 percent of adults 65 and older said gambling is their top spending category. Perhaps older adults who are nearing or in retirement are betting they can make more money to compensate for a lack of savings. After all, GOBankingRates' 2017 Retirement Savings survey found that 29 percent of adults ages 55 and older have $0 saved for retirement. However, boomers would be better off stashing the money they're using to gamble into savings because the chances of getting a return on their money are much greater than the odds at the casino, race track or lottery. Plus, if you're gambling away your money, you're leaving yourself with less for retirement, medical expenses or legal drugs for health conditions — which is what adults 65 and older spend the most on after clothing and fast food. 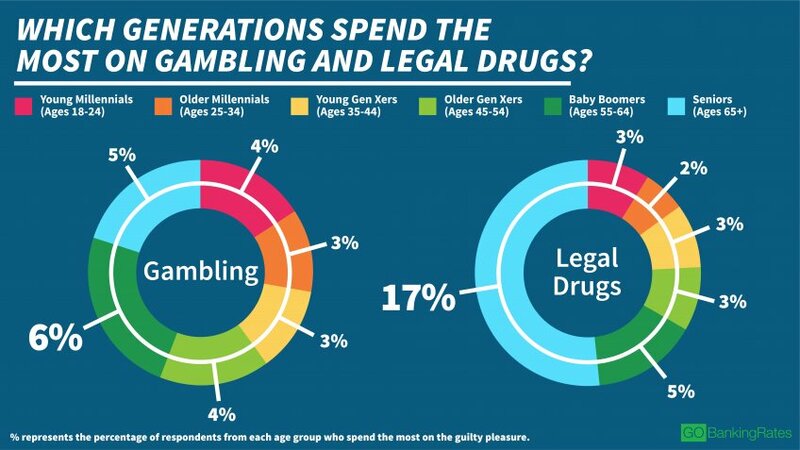 Nearly 17 percent of the oldest age group surveyed said their top spending category is legal drugs. But gambling can do more than affect your retirement savings. Problem gambling can lead to financial ruin, legal problems and even suicide, according to the National Council on Problem Gambling. The Midwest is the region where respondents are the most likely to say they spend the most on alcohol — 16.2% versus 15.4% in the Northeast, 14.5% in the West and 13.2% in the South. Midwestern respondents are also more likely than respondents in other regions to say they spend the most on tobacco — 7.9% versus 7.5% in the Northeast, 7.4% in the South and 6.6% in the West. Respondents in the West are more likely to answer that they spend the most on gambling — 4.8% versus 4.4% in the South, 3.5% in the Northeast and 3.4% in the Midwest. Northeast respondents are the most likely to say they spend the most on legal drugs — 5.5% versus 5% in the South, 4.5% in the Midwest and 3.5 percent in the West. Spending on prescription drugs has been on the rise nationwide and is expected to rise faster than overall health spending, according to the U.S. Department of Health and Human Services. Americans spent an estimated $457 billion on prescription drugs in 2015 and are expected to spend $535 billion in 2018. One of the key reasons drug spending has been rising is because of the increase in drug prices. Unfortunately, prescription drugs can be more than just a big expense many have to bear. Legal drug abuse — particularly opioid abuse — is a growing problem. According to the CDC, deaths from opioid overdoses have quadrupled since 1999, and more than 1,000 people per day are treated in emergency rooms for misusing these drugs. 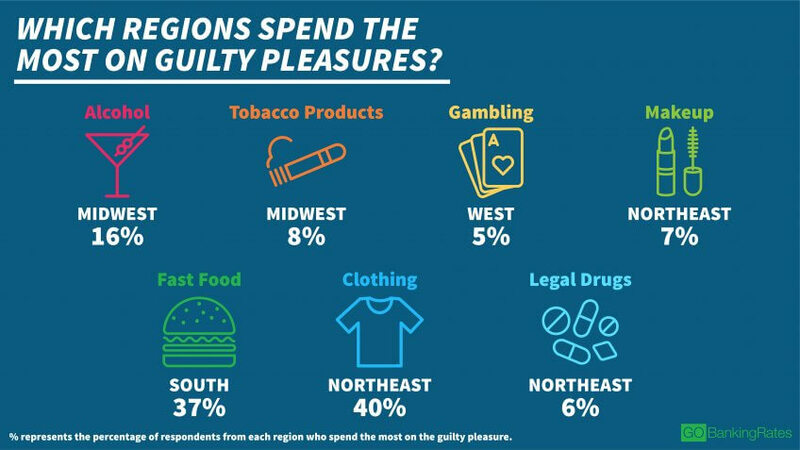 These survey results show that many Americans are spending money on guilty pleasures that can harm them and their financial well-being. To protect their wallet and their health, they might want to consider giving up some of these indulgences for good. 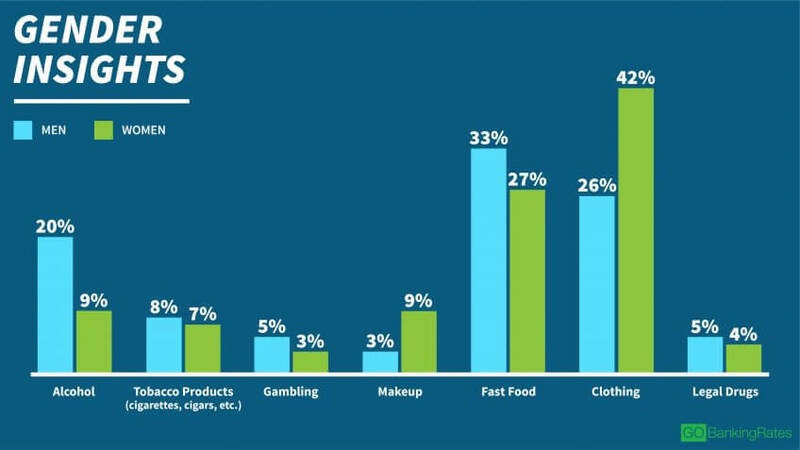 Methodology: The GOBankingRates' survey posed the question, "Which of the below do you spend the most money on?" Respondents could select one of the following answer options: 1) Alcohol, 2) Tobacco Products (cigarettes, cigars, etc. ), 3) Gambling, 4) Makeup, 5) Fast Food, 6) Clothing, 7) Legal Drugs or 8) Other. Responses were collected through a Google Consumer Survey conducted March 22, 2017 - 24, 2017, and responses are representative of the U.S. online population. The survey collected 2,512 responses. There is a 2.7 percent margin of error. If you're feeling the pain from a night of tequila-filled Cinco de Mayo celebrations, check out these 13 cheap hangover remedies.